Our Pittsburgh-based lawyers represent people and their families who have been seriously injured or killed in accidents in Pennsylvania, West Virginia, and Ohio. Based in Pittsburgh, we represent people, and their families, in Pennsylvania, West Virginia, and Ohio, who have been seriously injured or killed in all types of accidents (such as automobile accidents, industrial accidents, mining accidents), and in wrongful death claims. We represent people seriously injured or killed by defective products and equipment, what lawyers refer to as “product liability” or “strict liability” lawsuits. Sometimes the cause of an injury or death is a defective product. We are experienced in researching the product and working with appropriate experts to investigate the product’s background. G&O attorney Rich Ogrodowski is particularly interested in investigating personal injury and death claims involving the failure of fall protection equipment, including lanyards, harnesses, and rebar snap hooks, also known as pelican snap hooks. If you or a loved one has been seriously injured or killed in a car or truck accident in a roadway or highway construction zone, you may have a claim against the state or local government which awarded the contract, as well as against the contractor performing the work. For instance, the construction zone may have had a dangerous and defective traffic control plan. Feel free to call us to discuss the facts of your accident. The Pennsylvania Dram Shop Act makes it illegal for a “dram shop,” meaning a bar, restaurant, or other business licensed by the Pennsylvania Liquor Control Board (PLCB) to serve alcohol, to anyone who is “visibly intoxicated.” If you or a loved one have been seriously injured or killed because a drunk driver was over-served alcohol, you may be able to recover money damages not only from the drunk driver, but also from the bar, restaurant, or social club where the drunk driver was over-served. We are familiar with Pennsylvania’s “RAMP” program (Responsible Alcohol Management Program). In 2016, Pennsylvania’s Liquor Code was amended to require that anyone hired on or after Aug. 8, 2016, who serves or sells alcoholic beverages and/or checks IDs – including bartenders, waiters, beer distributor sales persons, bouncers, doorpersons, etc. – to complete RAMP server/seller training within six months of being hired by a licensee, unless the person successfully completed RAMP server/seller training prior to being hired. We handle these types of cases on a contingent fee basis. We also advance the costs for the lawsuit, including the fees of experts and consultants. This means a client will not owe us a fee unless and until there is a settlement or judgment in the client’s favor. When/if such occurs, the client would then owe us the agreed-to fee and any case expenses (such as court reporter charges, medical records fees, expert witness fees, etc.) which the client had previously agreed in writing were also its responsibility. We know that work wins cases and details matter when it comes to investigating and winning a case. We are known for thorough research into the facts and the law of the cases we take on. Having been deeply involved in significant personal injury litigation for collectively more than 40 years, we understand the medical issues surrounding the serious injuries that can occur in these types of accidents, particularly orthopedic and neurologic issues. We also know how devastating, both economically and emotionally, it can be to lose one’s ability to earn a living. This blog, produced by G&O partner and co-founder, Rich Ogrodowski, focuses on the law in Pennsylvania and West Virginia (and other practical issues that arise) when a family member or friend is unfortunately lost due to an accidental death. The accidents sometimes arise from: a defective product, a car accident, a motorcycle accident, a workplace accident, or a dangerous condition on someone’s land. The goal is to provide an informative accidental / wrongful death blog that has a personal touch while covering cases, statutes, and rules of civil procedure. The blog also covers publicly available news that might be of interest to readers. To reach the blog, where you can read current posts and subscribe to e-mail notification of new posts, click on the BLOGS link atop this website or visit http://paandwvaccidentaldeathlawyer.wordpress.com. 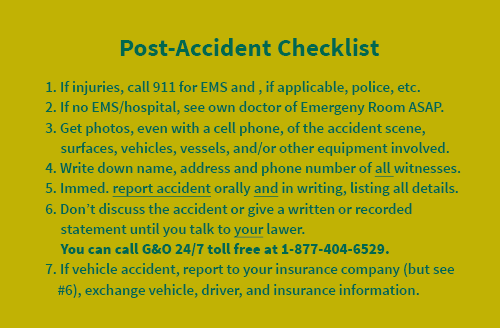 If you’d like us to mail you a free credit-card style heavy duty plastic post-accident checklist (see below) with our 24/7 contact info on the other side, just call us (412-281-4340 or 877-404-6529) or send us an e-mail and we’ll get one right out to you.